The theme is based on three Bible promises of peace and rest and being included in God’s promise of hope and protection. King David is promised rest from the oppression of enemies – a promise that we can stand on when we face oppression – in Galilee crowds finding Jesus’ compassion give us a promise of God’s mercy, including healing, and the reconciliation of Jews and Gentiles makes a present-day promise to all of being included in God’s promises without religious separation. David, as king, now had a palace built of stone and imported cedar while the ark remained under a tent covering, 2 Sam. 6:17. David felt that the heavenly King should be more prominently honoured than him. This word is also referred to as the Davidic covenant. It contains both national (v.10) and person (v.11) promises. “Are you the one?” – David’s God-given task was to fight the Lord’s battles to achieve rest, freedom from oppression, in the land that had been promised. See 1 Kings 5:3, 1 Chron. 22:8-9. 9 I have been with you wherever you have gone, and I have cut off all your enemies from before you. Now I will make your name great, like the names of the greatest men on earth. “Cut off all your enemies” – Bible material is often arranged according to topic rather than the exact chronology we would expect. The events of 2 Sam. 8:1-14 probably happened before this chapter. 10-11 And I will provide a place for My people Israel and will plant them so that they can have a home of their own and no longer be disturbed. Wicked people will not oppress them anymore, as they did at the beginning and have done ever since the time I appointed leaders over my people Israel. I will also give you rest from all your enemies. “Provide a place… for Israel” – the real purpose behind making David king. “Since…I appointed leaders…” – meaning the time of the judges who preceded Saul and David and the kings. “Establish a house” – the play on words is plain in translation. God does not David to build Him a house, or temple, but God will build David a house, or royal dynasty. Many Bible covenants are conditional with an”if” clause, but this covenant with David is unconditional, as with Noah, Abram and Phinehas. 12 When your days are over and you rest with your ancestors, I will raise up your offspring to succeed you, your own flesh and blood, and I will establish his kingdom. 14 I will be His father, and He will be My son. IN PRACTICE This teaching in the Old Testament from King David’s time contains the first of three promises from God of ‘rest’ which is a state of peace and trust from enemies. David’s enemies mostly appeared with a spear in their hands, and his battles are trials of military strength worked out in combat on the battlefield. In our world of NATO and Europol and summit talks, is all that irrelevant? Certainly not. Spiritual conflicts in the heavenlies, where the hosts of the defeated enemy, Satan, are still pursuing a vicious rearguard action, are played out in acts of terrorism, persecution and imprisonment of political opponents, and every kind of cruelty and injustice. When we encounter evil actions and evil people, we need to see the evil that is finding people’s vulnerabilities and insecurities to work through. Now turning to submit to God in worship, who has promised His rest, starts to make very present-day, practical sense. QUESTION When evil in one of its forms draws near to us, who do we draw near to? How do we bring God’s promises to bear? “Get some rest” – two meanings here. 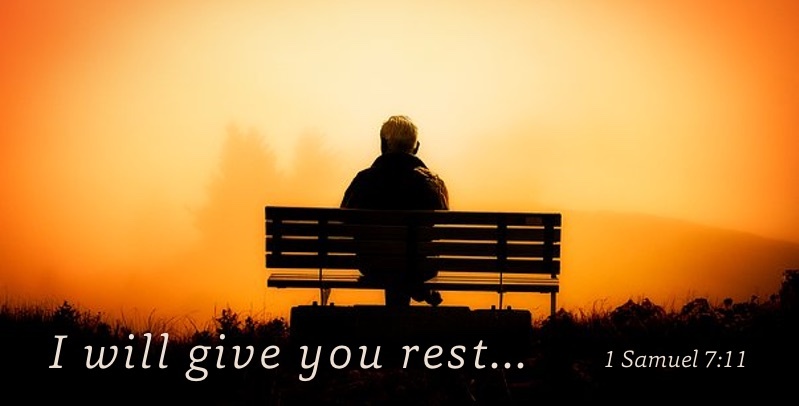 Another definition of finding rest is taking time in a quiet place with Jesus. 32-34 So they went away by themselves in a boat to a solitary place. But many who saw them leaving recognised them and ran on foot from all the towns and got there ahead of them. When Jesus landed and saw a large crowd, He had compassion on them, because they were like sheep without a shepherd. So He began teaching them many things. 53 When they had crossed over, they landed at Gennesaret and anchored there. Or crossed the shoreline. Gennesaret (modern-day Ginosar) is down the coast a little way, towards Tiberius. 54-56 As soon as they got out of the boat, people recognised Jesus. The crowd from vv.32-34 could see the boat and follow its progress on foot. They ran throughout that whole region and carried the sick on mats to wherever they heard He was. And wherever He went – into villages, towns or countryside – they placed the sick in the marketplaces. They begged Him to let them touch even the edge of His cloak, and all who touched it were healed. “All who touched it…” – a clear statement. See also Matthew 8:16-17. IN PRACTICE To seek a divine encounter with the promise of healing is entirely in line with this teaching, but out of line with most of our experience. It’s controversial. We all know people who have struggled with illness. For some, their earthly life appears to have foreclosed early and suddenly. The account of people flocking to Jesus, pressing in to Him and the statement that “all who touched [His cloak] were healed” leaves us with both a promise and also a problem. The promise seems clear enough, but so is the expectation of coming to the Lord (who we can’t touch) and trust in Him, when we have so many alternatives to trust in. Some we know from their stories are miraculously healed; for many it is a process and good medicine may be experienced as God’s gift. For some, the healing is total in transition to new and eternal life. Our philosophy is inadequate to explain this, but let’s not let lack of predictability and our sense of control and reason stop us from simply trusting and believing what God has written. QUESTION In the battle that goes on in our minds between reason and logic and trusting in what God says, how do we referee the contest? 11-13 Therefore, remember that formerly you who are Gentiles by birth and called “uncircumcised” by those who call themselves “the circumcision” (which is done in the body by human hands) – remember that at that time you were separate from Christ, excluded from citizenship in Israel and foreigners to the covenants of the promise, without hope and without God in the world. But now in Christ Jesus you who once were far away have been brought near by the blood of Christ. “Remember that formerly… at that time” – referring to those outside a personal relationship with Christ, as they were when they “followed the ways of this world and of the ruler of the kingdom of the air…”, Eph. 2:1-10. We are either committed to belong to Christ, or we are by default under the sway of the devil. “You who are Gentiles” – most of those in the church in Ephesus. The rite of circumcision was a clear mark of distinction and also pride. A major exclusion in the ancient world, between people groups hostile to each other, is reconciled in Christ. “Two groups one” – believing Jews and believing Gentiles. “Destroyed the barrier” – a barrier of prejudice. Jews and Gentiles practised strict religious isolation from one another. Gentiles in the Jerusalem temple area were not allowed past the barrier in the Court of the Gentiles. 16 …and in one body to reconcile both of them to God through the Cross, by which He put to death their hostility. “One body” – God sees those who are the Lord’s, those who are His, as one body of Christ. 17-18 He came and preached peace to you who were far away and peace to those who were near. For through Him we both have access to the Father by one Spirit. “Far away and… near” – Gentiles, unlike Jews, had no cultural experience of the Living God and so were not as “near”, although both had shared the same need to come into personal relationship through Jesus and His Spirit. “Foreigners and strangers” – addressing what had been a deep-seated division. 20 …built on the foundation of the apostles and prophets, with Christ Jesus himself as the chief cornerstone. “Cornerstone” – hundreds of years before Christ, Isaiah spoke of God laying a “tested stone” as a cornerstone foundation, Isaiah 28:16, meaning the Messiah to come. “Foundation of apostles and prophets” – the early church was built on these ministries as people were sent out in ground-breaking roles. Church planting in our time, both overseas and new congregations at home, require the equipping ministries mentioned later in the letter, Eph. 4:11-13. IN PRACTICE The third teaching in this theme of God’s promise of our inclusion in His hope and His promises, and therefore our rest, is about who is included and whether there is a kind of hierarchy of privilege. We think there is. We think that our religious obedience, however that is expressed, gets us up the queue line because that’s how we as humans are programmed – so much in our education, professional life and general experience is based on merit. When ministers began to take the Good News of Jesus outside the confines of pews and pulpit (as John Wesley did in the 1700s and many others since) God’s love and grace for the apparently underserving presented many surprises to the religious mind. He loves to overturn our comfortable theology! Back in the first century, it was the same. The Jews really did consider themselves God’s chosen people, even if they had largely rejected their own Messiah. They wanted to treat the ‘outsider’ Gentiles as second class, if they had dealings with them at all. God confronted that exclusivity of attitude in them, and He still does in us. Formal religion has created all kinds of barriers to knowing God’s love and He delights in opening another door that needs no ticket other than a desire to enter in and experience Him. QUESTION If you see another person in church who dresses differently, behaves differently and just is – different, how do you view them and how does God view them – and how will you love them anyway?